The Anthropocene is the proposed current geological epoch in which the earth’s climate is affected by human influence. Nature was the standard in which species evolved, and now nature must adapt to conditions created by one of its byproducts. Within the anthropogenic landscape, nature—defined as that which exists independent from human involvement—is difficult if not impossible to distinguish from that which is naturalized: what appears to be natural but is actually a product of human influence and adaptive processes. My practice focuses on the perception of the anthropogenic landscape, using photography, 16mm film and gallery installation, to build a discourse between concepts of what is natural and what is naturalized. A Dark Shape on the Horizon continues my research into the anthropogenic landscape and focuses on the larger industrial and economic forces of mining and how they act as physical manifestations of humans as a geological force. Initial research for this project has drawn me to sites situated around the Guichon Creek batholith that runs north from Washington State through south central BC, which contains a significant amount of copper mineralization that has been exploited for several decades. 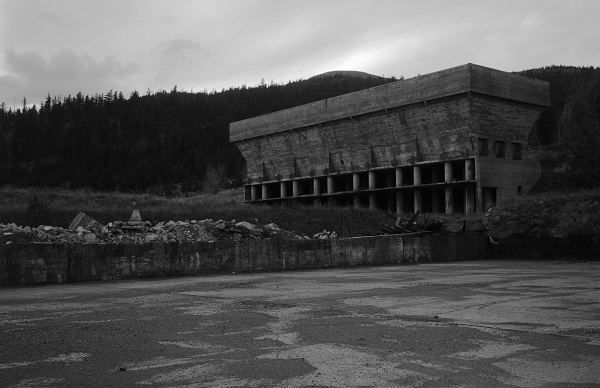 These sites include the currently inactive Craigmont mine north west of the town of Merritt and the active Highland Valley mine near to Ashcroft. In the last glaciation period, large sheets of ice carved steps into the sides of the mountains that flank the Nicola River, and these forms are mirrored in the steps of the open pit surface mines. I am interested in drawing connections between mining practices, natural geologic processes, and the contingent formations created by both ancient ice flows and resource extraction. Curtis Grahauer lives and works in Vancouver, and recently completed his MFA in Interdisciplinary Studies at Simon Fraser University. His research focuses on the way landscape is shaped by intertwining forces of human activity, such as economics, recreation and agriculture. Bachelor of Media Arts – Emily Carr Institute of Art and Design, Vancouver, BC. Tidal Pool (August-September), Platforms: Coastal City, outdoor video screen commission, Vancouver (public installation). 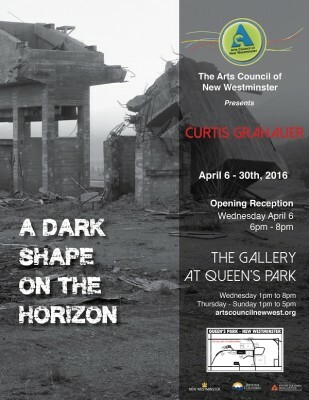 A Dark Shape on the Horizon (April), Gallery at Queen’s Park, Arts Council of New Westminster (solo). Philip B. Lind Prize Exhibition (April), Roundhouse Community Centre, Vancouver (group). As far upriver as you can go before having to switch to a pole, Audain Gallery, Vancouver (solo). Floodplain, Dynamo Arts Association, Vancouver (solo). Compassion Fatigue, New Wight Biennial, UCLA, Los Angeles CA (group). Ny verk, SÍM, Reykjavik, IS (group). Rolling Thunder, Interurban Gallery, Vancouver (solo). Scotiabank Nuit Blanche, Toronto (public installation). re-LIVE, LIVE Biennale, Vancouver (group). Artist in Residence, The Sointula Art Shed, Sointula, BC (May). Philip B. Lind Emerging Artist Award (shortlist), Presentation House Gallery, North Vancouver. Simon Fraser University Service Award. Travel/Minor Research Award, Simon Fraser University. Scholarship for Visual Arts, British Columbia Arts Council. Faculty of Communication, Art and Technology Graduate Travel Award, SFU. Graduate (International) Research Travel Award, SFU. Steven Shane Annual Graduate Entrance Scholarship, SFU. Artist in Residence, SIM Residency Reykjavik, IS. Project Grant, Neighbourhood Small Grant Program, Vancouver. Artist in Residence, Klondike Institute of Art and Culture, Dawson City. Project Assistance Grant for Visual Arts, British Columbia Arts Council. Travel Grant, Canada Council for the Arts. Curatorial Residency, Unit/Pitt Gallery, Vancouver. Professional Development Grant for Visual Arts, British Columbia Arts Council. Grahauer, Curtis. “The Young Romantics.” The Peak (Burnaby, BC), June 8, 2015. —, “Interview with Emiliano Sepulveda.” The Peak (Burnaby, BC), April 11, 2015. —, “Super, Unnatural BC.” Bartleby Review (Vancouver, BC), April 2015. —, “Art collection in AQ North Concourse illustrates BC colonialism.” The Peak, March 9, 2015. —, “The surprising story of SFU’s blue pyramid.” The Peak, March 2, 2015. —, “Interview with Adrienne Evans.” The Peak, February 16, 2015. —, “Participation—Production—Presentation.” SFU Galleries blog, February 3, 2015. —, “Interview with Jaime Williams.” The Peak, January 12, 2015. —, “Staring at Nothing.” The Peak, November 17, 2014. —. “Empirical Observations in 16mm.” The Peak, November 3, 2014. —. “Interview with Lucien Durey.” The Peak, October 20, 2014. Ramsey, Justin. 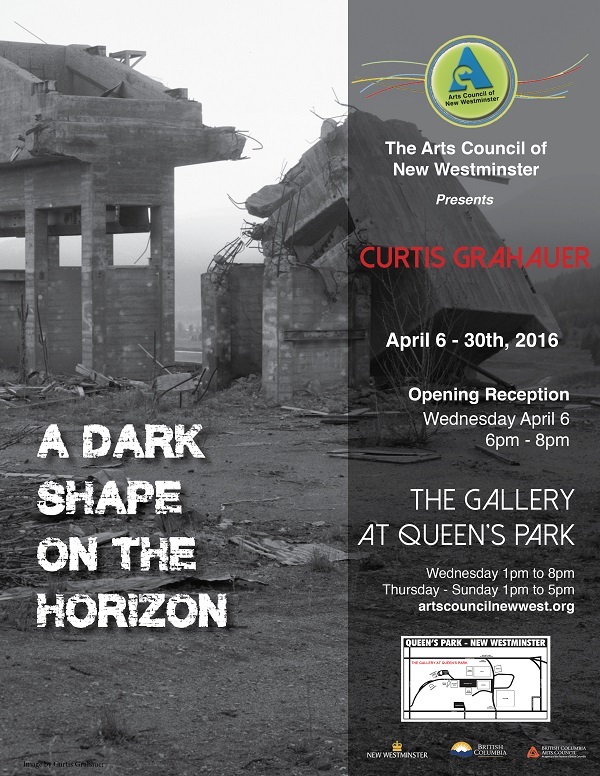 “Exhibition review of Curtis Grahauer, Slump.” Simon Fraser University School for the Contemporary Arts, March 2014. “Nuit Blanche 2011” NOW, Toronto. Sept 29-Oct 5, 2011. Artist catalogue. Public Access: 1999 & Beyond. Unit/Pitt Projects and Publication Studio (Vancouver, 2011). Turner, Leah. “Weekend Leisure Network” COLOR Magazine, Fall 2010. Sawatzky, Rachelle. “Cultural Programming in Vancouver During the 2010 Winter Olympics” C Magazine, Summer 2010. Birch, Jesse. “A Sea of Contingencies: Vancouver’s Domestic Interventions” C Magazine, Autumn 2009.